Creates a common style for a group of features destined for the OGCKML writer. This parameter specifies whether the first feature through the transformer defines the common style that will be used for all features that pass through the transformer, or whether each feature can supply a unique style. Unique styles per feature create larger output files but allow for different settings, such as color, per feature. This parameter specifies the pen color of the feature used to render the feature in the set color. The pen color determines the color of lines, and area boundaries. To edit this parameter, click the browse button to the right of the text field. This parameter specifies the fill color for an area geometry on a feature used to render the interior feature in the set color. To edit this parameter, click the browse button to the right of the text field. Opacity specifies the opacity of the pen color of the feature. A value of 1.0 is fully opaque, and 0.0 is completely transparent. Fill Opacity specifies the opacity of the fill color of the feature. A value of 1.0 is fully opaque, and 0.0 is completely transparent. Icon Name specifies either the name of an icon selected from the icon picker, or a filename/URL of a valid image file. This parameter specifies the scale of the icon. The scale is a multiplying factor, where 1.0 is unscaled. The lower scaling bound is 0.0, and there is no upper bound. If the value is exactly 0.0, Google Earth will not display the icon. The actual display size of the icon will vary according to how each Google Earth renders the dataset at various altitudes. This value has no units. This parameter allows the specification of a color that Google Earth will apply to the icon when it is displayed. This works best with white icons. Results may vary for icons which are already colored. This parameter specifies the opacity of the icon. A value of 1.0 is fully opaque, while a value of 0.0 is completely transparent. Line Width specifies the width of line geometries and boundaries of area geometries. Specifies the units for the previous parameter value. If the value of the parameter is ‘Pixels’, the line geometry will be a constant width at all zoom levels. As a result, it will appear narrower, relative to the ground when the view is zoomed in and wider when the view is zoomed out. If the value is ‘Meters’ the line width will be constant relative to the ground. As a result, it will be wider when the view is zoomed in, and narrower when the view is zoomed out. If this parameter is set to ‘Yes’, the name of a KML feature (taken from the kml_name format attribute) will be displayed as a label along the length of the line. Label Style Scale specifies a unitless scaling factor that the KML Viewer applies to the default size of the label when rendered. 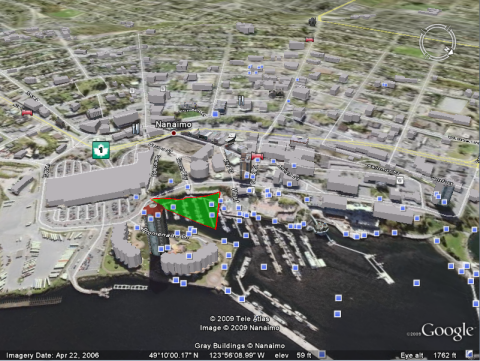 Labels are rendered by KML Viewers, such as Google Earth, when the feature has both a KML name and a point geometry. The KML Writer will convert text features to KML points that have a name property. It is not possible to specify label size in terms of absolute units. This parameter specifies the color in which the feature name will be displayed. This parameter is optional. If no value is given, the feature name will be displayed in white text. The color value may be selected using the button next to the field, or may be manually entered. The color must be specified as <red>,<green>,<blue> where each of <red>, <green>, and <blue> is a number between 0 and 1. This parameter specifies the opacity of the label. A value of 1.0 is fully opaque, while a value of 0.0 is completely transparent. This screen capture shows a polygon that has had its color and fill color set by the KMLStyler.